Anamnesis is an audiovisual installation about the theme of recollection. 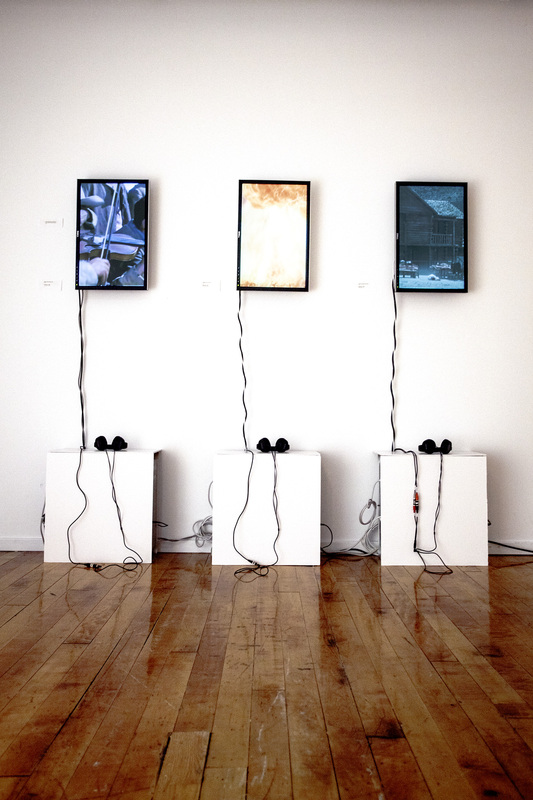 It consists of three sound studies and three silent video panels arranged in form of a triptych. Video and audio play asynchronously in different loops. Each panel is a result of its corresponding study. Conversely, each study was inspired by sounds from three films utilized as the source of the footage that is employed in the triptych’s sections. However, the audio samples were a reference in an early stage and I never expected them to survive the process. As a result, what is left of the source is a trace of its essence, in one case nothing at all. All panels are arranged with a sense of synchronicity in relation to their source: the years 1966, 1967 and 1968. But they all become inevitably asynchronous through the viewers’ perception. The common hierarchy between soundtrack and film is hereby disrupted from the creative process to the final presentation and while all panels are formally dependent on the original material, each loop represents a dramatic reduction of the original. With the omission of main characters and important plot sequences I establish a new ground for interpretation. Additionally, the resulting tension between the sound composition and the recurring imagery induces a new narrative determined by the spectators’ perception. Étude1: Old Cowboy Trick / 4′18″Addendum: 1966 / Tuba. Clarinet. Violin. Addendum: 1967 / Car. Gasoline. Bullets. Addendum: 1968 / Peasant. Bullet. The following is a simplified demo of the triptych on display at the installation.